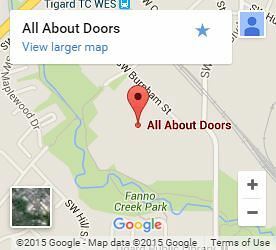 Whether you need installation, repair, or replacement of your garage doors Lake Oswego, All About Doors has you covered. With more than 25 years in the industry, we’ve been proud to serve the residents of Lake Oswego, providing quality garage doors at an affordable price. With robust services that cover every need for both residential garage doors and commercial garage doors, we’re with you no matter where you need us. • Tune ups – Recommended for garage doors Lake Oswego every 2 years. Tune ups can save time and money in the future by preventing the need for costly repairs. • Spring Repair – Garage doors Lake Oswego have springs that carry enough tension to be fatal. Professional spring replacement is performed fast, with quality parts, and keeps you safe. • Installation – All of our garage doors Lake Oswego are built to last and come with a 1 year parts warranty and 30 day labor warranty. We have a wide selection of garage doors to choose from. • Replacement – If you have a broken garage door or want a new style, we can replace your existing garage door and haul away your old garage door. • Repair – Whether elemental, accidental or intentional damage, many garage doors Lake Oswego can be repaired when they suffer damage. We provide extensive garage door repair services that will have your door as good as new in no time. No matter what services you need for your garage doors in Lake Oswego, call (503) 620-2453 or contact us today.